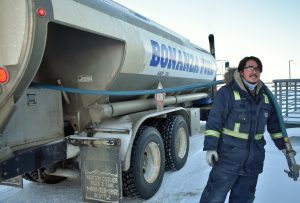 Bonanza Fuel, LLC offers quality storage and trusted delivery of energy products in Nome including the Port of Nome. We have a fleet of fuel and propane delivery trucks for reliable deliveries to commercial, marine and residential customers in Nome and the surrounding road system area as far as Teller, Alaska. For over 25 years, we have successfully delivered energy products including heating oil, diesel, gasoline and propane to all locations in Nome, remote road accessible areas, and to marine vessels at the Port of Nome. Our fuel storage facility is connected by pipeline directly to marine headers at the Port of Nome. This enables us to safely and efficiently deliver large volumes of marine fuel directly to marine vessels. Bonanza Fuel recently expanded its bulk fuel terminal and has a total storage capacity of 5.9 million gallons located at the Port of Nome, which can both receive and deliver bulk fuel to marine vessels during the ice free summer months. Our office is conveniently located at 214 Front Street on the Second Floor, in the same building as the Sitnasuak Corporate Headquarters, where friendly staff can assist with any fueling needs you may have. To place fuel orders and autofill requests (monthly to weekly) by phone 907-387-1201 or come see us at our Nome offices at 214 Front Street, Second Floor. After-hours/weekends fuel orders can be placed at 907- 304-2086. For customer quotes, information or comments, e-mail us . Payment options include cash, check, debit-credit card &/or accounts for commercial and residential customers with approved credit. Bonanza Express is our Nome convenience store & gas/diesel station is open 7-days a week at 400 Bering Street. Come visit our store. Gas/diesel pumps are available 24/7 via self-service credit/debit/Blue (Fleet) Card. Customers can earn rewards with Express Stickers – awarded one sticker for every $20 spent (including gas/diesel)! Reward Stickers must be collected at time of purchase & can be used for Alaska Airline Miles or Discounts off purchases. 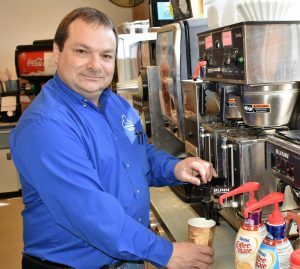 Bonanza Express has product offerings from snacks, coffee, soft serve ice cream & convenience items. Best sellers include energy drinks, self-serve cappuccino, chips, & candies. Branded products include hoodie sweatshirts, hats, coffee mugs, & Bluetooth speakers/headphones. An ATM is available in store. Banner Wind, LLC is a joint effort of Sitnasuak Native Corporation and Bering Straits Native Corporation. The business harnessed the power of wind to generate renewable energy in the community of Nome. The wind generators are currently under the operational control of Nome Joint Utilities and can contribute up to 30% of the City of Nome’s power needs on a windy day.